Okay, this could be one of those desserts that is insanely good or really odd and awful. The presence of quantro has it leaning toward the good side. 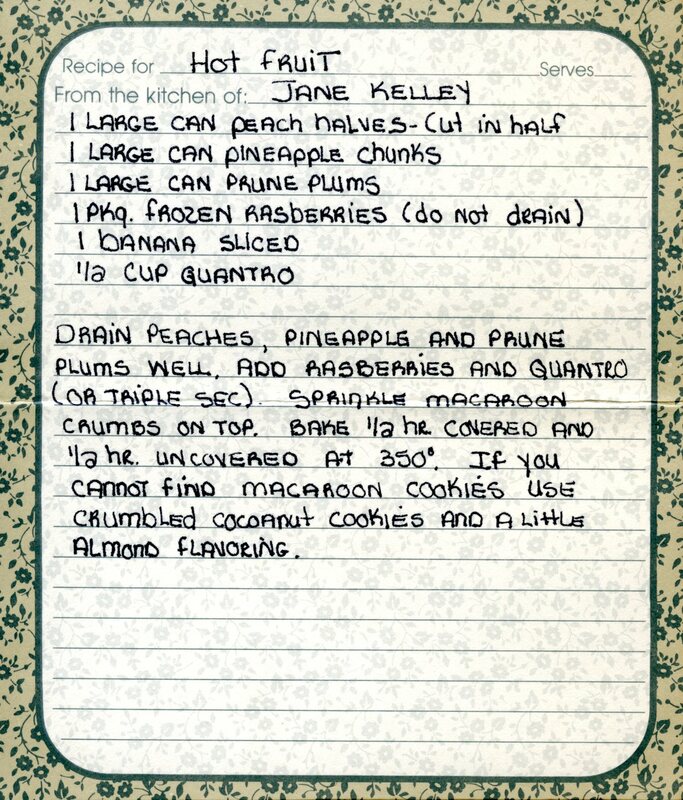 I also think it might be good to use fresh pineapple when possible, and it might also be good with fresh peaches. Drain peaches, pineapple and prune plums well. Add raspberries and quantro (or triple sec). Sprinkle macaroon crumbs on top. Bake 1/2 hr covered and 1/2 hr uncovered at 350°. If you cannot find macaroon cookies used crumbled cocoanut cookies and a little almond flavoring. Great recipe! I love seeing these vintage recipes. Sometimes fresh pineapple, NOT peaches though, can do harm to a dish, especially jello. There is an enzyme in it that prevents things from gelling. It might be OK to use fresh in this as it sounds like a rhubarb or apple sauce consistency. It does sound GOOD!